The sinister phase two of Microsoft's Kinect plan picks up steam as the company makes Kinect for Windows impeding arrival official. Are you ready to do everything six to eight feet from a computer screen? 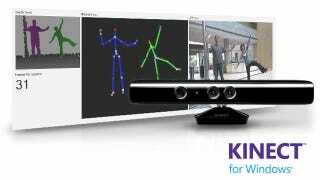 With hundreds of financial, educational, and commercial companies signed up to see what Kinect can do for them, next year could very well be the year of standing a few feet away and waving frantically. Microsoft has just launched the official Kinect for Windows website, where hopeful developers can download the newly-released beta 2 SDK. After spending the past year seeing some rather spectacular amateur Kinect PC development efforts, it should be quite interesting to see what multinational corporations do with Microsoft's magical camera stick.